I don't know what possessed me to want to go to Palm Springs, but whatever it was, I'm glad we went. We spent about 24 hours in the desert and managed to leave refreshed and relaxed! Needless to say, I'm newly obsessed and can't wait to go back. 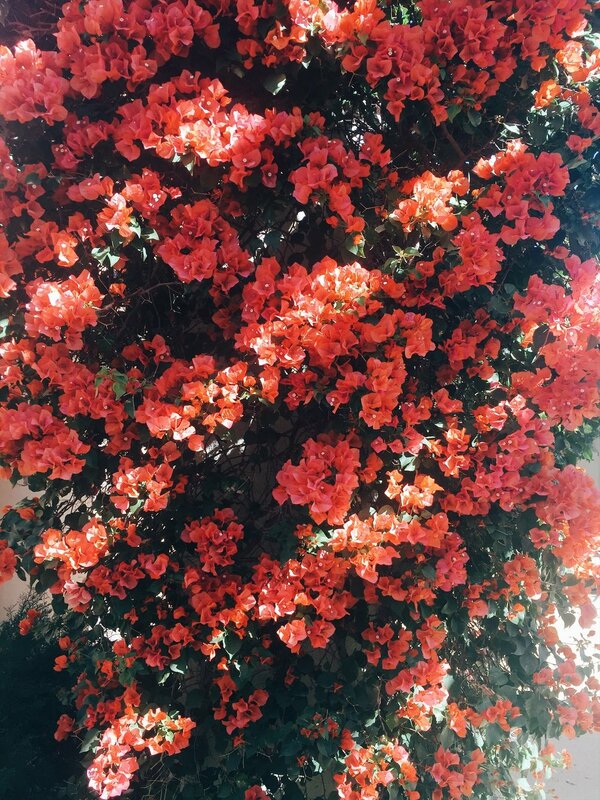 We woke up early Saturday morning – like, 4AM early – to make the drive down to Palm Springs. I know flying would have saved us some time but flights weren't in our budget and neither of us hates driving, so we drove. Leaving super early made the drive painless, plus it meant we got to the desert before lunchtime! I’ve already waxed poetic about this jumpsuit but let me say it's a must for traveling while pregnant. Really, it's a must regardless of whether or not you’re traveling but the knit material gives you plenty of room to stay comfy without completely sacrificing style. My sister generously gifted us a night at The Saguaro and it. was. awesome! The whole vibe is colorful, playful, and downright fun! Every room is brightly colored and there's a DJ bumpin' party tunes by the pool. They also have cruiser bikes! Something I would want to take advantage of next time I find myself in Palm Springs. We walked up to the front desk just to see if our room was ready and sure enough, it was! We dropped our things off in our orange room, changed out of our travel clothes and headed downstairs to grab lunch at El Jefe, the main restaurant at the hotel. We split an order of carnitas nachos and left the skillet practically clean. The carnitas was some of the best I’ve had and I even enjoyed the little kick of heat from the jalapeño slices – which is a big deal because I don’t do spicy food. Our server told us it was enough for three to four people to split and I think he would have been right had we been splitting it as an appetizer and not a main dish. The cocktail menu is awesome. I caught myself about to ask Brandon for a taste of his margarita like three times because of how good it looked! The pregnancy brain is real, my friends. But don't worry, I steered clear of the booze. After lunch, we headed out to the pool to try to score a spot in the sun. After a quick lap around the pool we found only busted loungers, so we posted up in a couple hammocks as we figured out what we wanted to do. 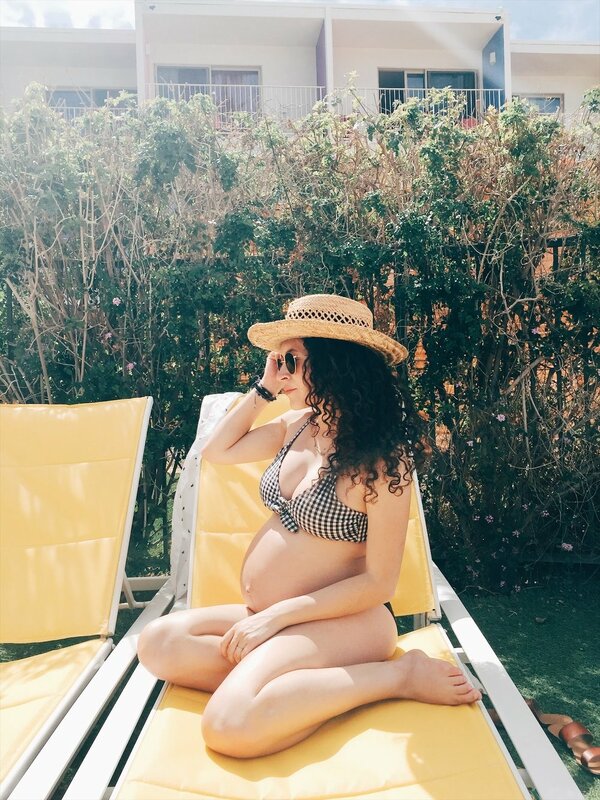 The original plan was to chill by the pool on Saturday and do a bit of sightseeing on Sunday before heading home but with no place to chill by the pool, we decided to flip the plan. 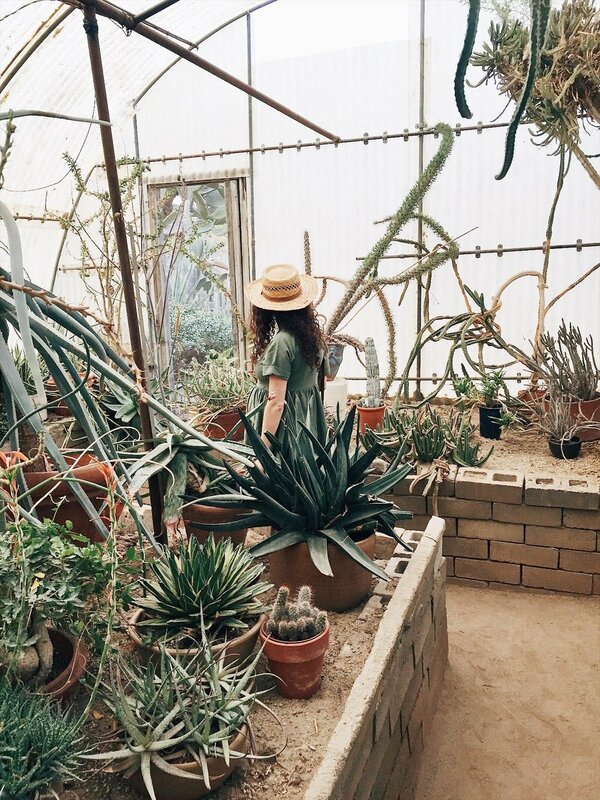 We hopped in the car and drove out to Moorten Botanical Garden, better known as the Botanical Garden of Instagram and Pinterest Dreams (kidding, kind of). I promise you’ve seen this place online and for good reason. It’s completely adorable. 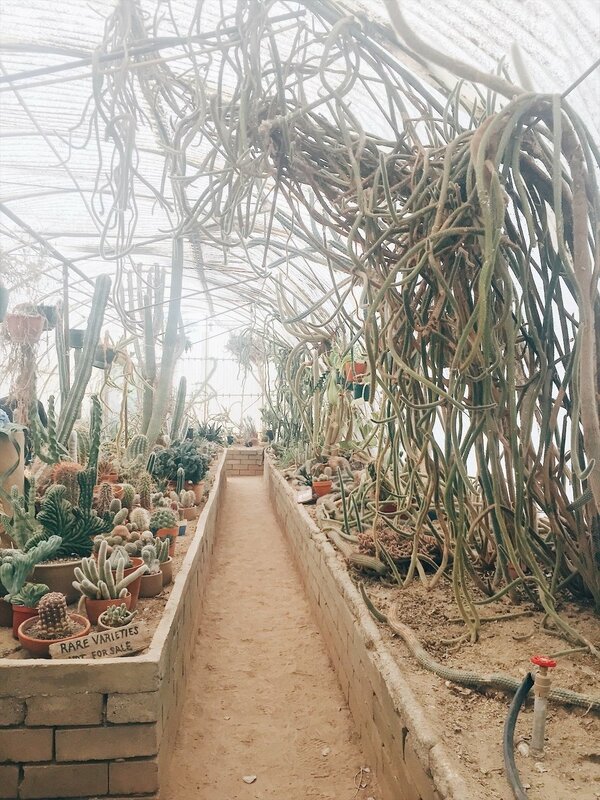 Entry costs $5 per person and you get to meander around all these different types of cacti. It's not the largest botanical garden out there but it's by no means small, either. 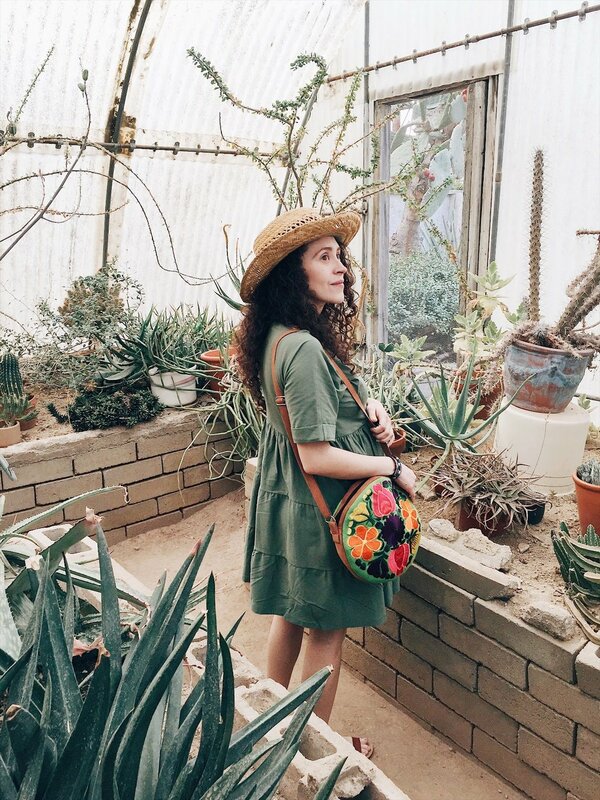 It was a nice way to get up close to nature via plants, especially as a pregnant lady who can't really go hiking up hills and mountains. We walked slowly, snapping photos and chatting about whatever came to mind. Then we got to the cactarium. It was magic. SO MANY PLANTS! There was even more to enjoy in the garden besides the insta-famous cactarium and we leisurely took the rest of the garden in. 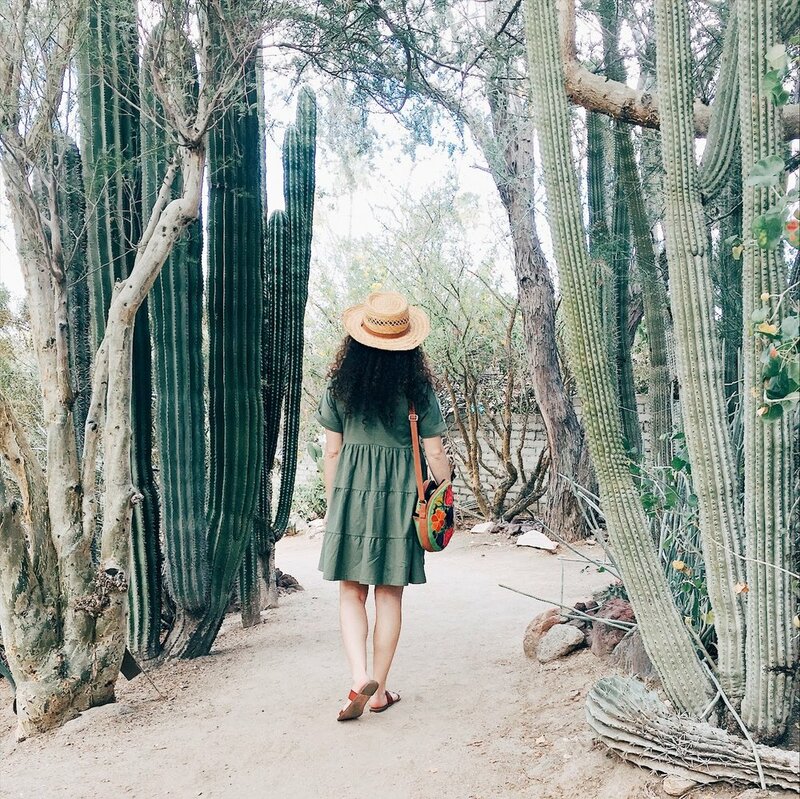 We skipped on the souvenirs this trip, but a cactus plant from the botanical garden would be a super cute way to remember a visit to Palm Springs. I was fully relaxed and in vacation mode by the end of our visit to the garden, which meant I was ready for some ice cream! We drove to Ice Cream and Shoppe which is a completely adorable shop at the Arrive Hotel. 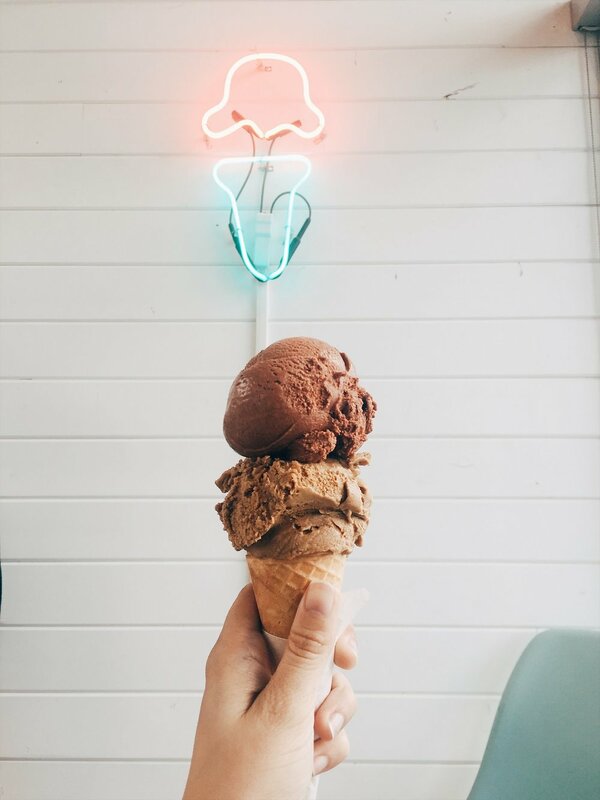 I had a scoop of the cappuccino crunch and Mexican chocolate on a sugar cone for my first visit (spoiler: we went back the next day). The Mexican chocolate was good but might have had some spice or heat in it that was almost too intense for me. I think it would have been fine if I wasn’t pregnant. But the cappuccino crunch was amazing! Such good coffee flavor and not too sweet. We sat up at the counter and scoped out the fun things for sale at the shoppe end of the store. Lightboxes, pool floaties, and modern prints are just some of the things on display. We took a detour to see Walt Disney’s house on the way back to the hotel. It turned out to be really close to a bunch of other homes with fun doors, including the infamous pink door. We did a drive by tour using this handy map and just enjoyed seeing the doors and mailboxes. The owners of That Pink Door aren’t allowing photos anymore, which I wasn’t heartbroken about because pink isn’t that important of a color to me (I often joke that I don’t like pink unless we’re talking wine). You guys know I love to check out at least one local coffee shop whenever I travel. Koffi was rated well online and mentioned by several bloggers as a good place for coffee in Palm Springs. But to be honest, I found it to be mediocre. Maybe I'm a just a coffee snob, but the latte I ordered wasn't good. Definitely not the coffee experience I was hoping for. It does share a nice outside courtyard with the surrounding businesses, just be prepared to swoop the first available seat. It was crowded that Sunday morning. If I went back, I'd try out Ernest Coffee which serves Stumptown or Customs Coffee (also at the Arrive Hotel) which serves Intelligentsia. Ok, ok, I'm probably a coffee snob. We woke up early Sunday morning partly because it's a habit but also so we could try to beat the crowd for a table at Cheeky's. They don't take reservations and I'd read that the wait can get really long, but luckily we were there early enough where we only waited about 30 minutes for a table. Brandon ordered the chilaquiles and I ordered Blondie's Benedict. I came very close to ordering the breakfast sandwich but passed after I realized I'd have to pay like $3 extra to get eggs on the breakfast sandwich. The chilaquiles looked nothing like any I'd seen before but Brandon said they were delicious and had a good kick to them. My eggs benny were also really good, although the hash browns tasted like they'd been sitting out for a little while. The star of our breakfast was the fresh squeezed orange juice. Holy moly, was every drop delicious! Totally worth the $6 price tag. Overall, the food was good but not mind blowing. I'd probably go back just for that OJ, though. It was that good. The menu changes weekly, but it's available online in case you want to scope out your options ahead of time. We had a late check out so we spent the rest of our time chilling by the hotel pool. The sun was out and so was my belly. I didn't bring anything to read so I just laid out with my eyes closed, soaking up every second of sunshine until it was time to check out. Our mini-getaway was a little over 24 hours but Brandon and I both felt like we'd spent a full weekend away. That's the power of true relaxation! 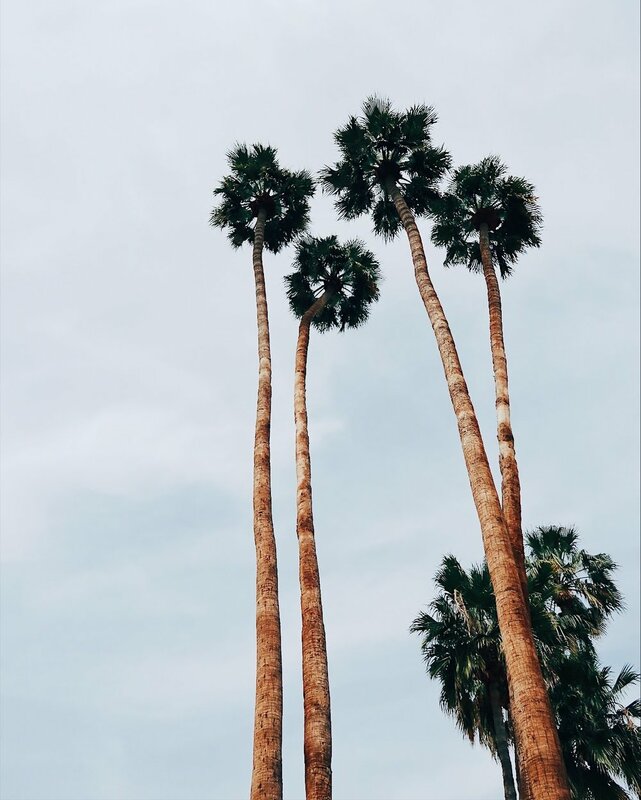 There's so much more to see in/around Palm Springs, I honestly can't wait to visit again!